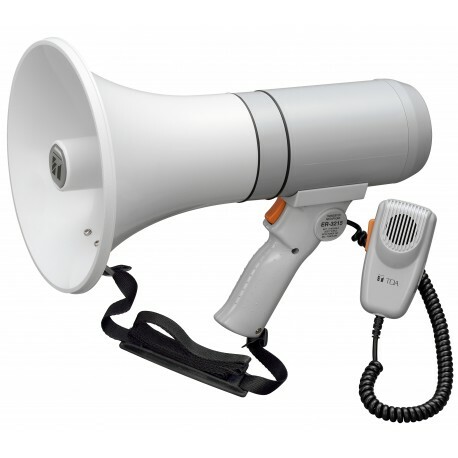 ER-3215 The ER-3215 is an easy-to-operate, hand grip type 15 W megaphone with a removable microphone. It can be used as a shoulder-type megaphone when the microphone is detached. The newly developed polyimide diaphragm is employed to ensure high sound quality. Specification Power Source R14P (C) × 6 (9 V DC) Rated Output 15 W Maximum Output 23 W Battery Life Approx. 9 hours (JEITA)* Audible Range Approx. 400 m (JEITA)* Diaphragm Polyimide film (voice coil, bobbin) Operating Temperature -10 to +40. Finish Horn: ABS resin, light gray Mouth, battery case and handle: ABS resin, gray Strap: Nylon, black Dimensions 210 (W) × 291 (H) × 381 (D) mm (when attaching the microphone) Weight Body: 1.15 kg (without batteries and microphone) Microphone: 150 g (*)JEITA: Japan electronics and information technology industries association. Technical data sheet for the TOA ER-3215 megaphone.